When the Post Office Tower was officially opened on 8 October 1965 by Prime Minister Harold Wilson, it was Britain’s tallest building. It was also seen as a symbolising a new, exciting technological revolution and a new spirit of optimism, and it successfully captured the public imagination. In the words of a General Post Office (GPO) publicity leaflet, the Post Office Tower rose ‘like a giant lighthouse above the London streets’. It became a major landmark on the skyline of London – and there wasn’t any competition from skyscrapers in those days. It soon became a instantly recognisable signpost for pilots flying into London. It had a total height of 620 feet, including a 40 ft mast. Why was it so tall…indeed, why was it built in the first place? The short answer to this question was that the Tower was built to provide more long distance telephone circuits and more television channels. Before going into more detail, I should explain that, before 1982, the Post Office enjoyed a state monopoly over the main telecommunications network in the UK. In the 1950s and ‘60s there was a huge expansion of trunk telephone and television networks between London and the provinces. Also, more channels were required to extend the BBC 2 625 line service, and to enable the introduction of colour television. The traditional method, for relaying telephone calls and tv channels, was to lay underground cables. But it would have been very costly and difficult to lay multiple cables into the heart of London. The Post Office started to turn their thoughts to an alternative solution – of erecting a radio tower in the centre of London, tall enough so that the beams would not be blocked by existing buildings. It would use microwave radio channels to carry telephone calls and tv programmes. In 1960, the Post Office made its case to The Treasury and the financial argument, that this solution this would be considerably cheaper than cabling – won the day. Similar towers had been constructed in Stuttgard and Dortmund, but the Post Office Tower was intended to showcase some new features. The Tower was designed by the Ministry of Public Building and Works. The principal building contractors were Peter Lind & Co, and construction began in June 1961. The tower was conceived as as a narrow cylinder of glass, steel and concrete. The aerials that would be fixed to the tower could not be allowed to move – or no more than the slightest movement – otherwise there would be significant loss of signal power. So maximum stability was crucial. The base rested on a 90 ft square, 3ft thick concrete raft which was sunk 24ft below ground level. 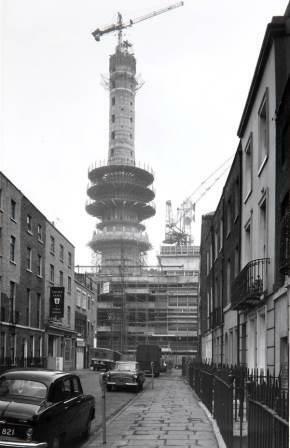 I find the following images, of the tower taking shape, fascinating, and though I’m surmising, I’m sure that the majority of Londoners were fascinated at the time. 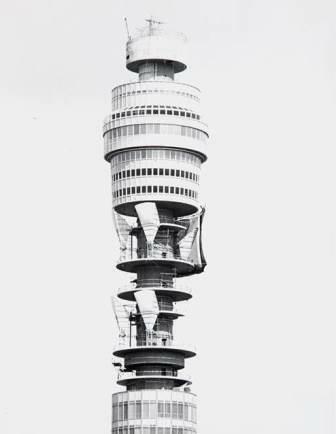 Quoting from a GPO publicity leaflet: ‘Besides its strictly functional use the Tower will also add to the itinerary of London’s attractions. The public will be able to view the panorama of London from galleries near the top of the Tower. Two lifts, each travelling at 1,000 feet a minute, will carry passengers to the three public observation platforms. With the revolving restaurant, the outside area rotated around the central core. The Tower was operationally opened on 8 October 1965 by Prime Minister Harold Wilson, who tested the new equipment by making an inaugural phone call to the Lord Mayor of Birmingham. Wilson was accompanied by Tony Benn (Postmaster General) and Clement Attlee (who had been Postmaster General back in 1931). Having unveiled a plaque near the public entrance, Wilson and his entourage took a lift to the observation gallery for a view of London some 540 feet below. In his diary entry, Benn recorded that ‘it was so misty we could hardly see anything at all’. The Tower was opened to the public on 19 May 1966 and was an immediate success. The GPO were quick to see the commercial possibilities. They could re-coup some of their costs through admission charges, which at one point were proposed to be 4 s for adults, but in May ‘67 were altered to 1s 6d per adult and 9d per child under fourteen years of age. Visitors could purchase a whole range of items in the Tower shop, including a model of the Tower, a guide book, and special wallets, key rings and glassware. 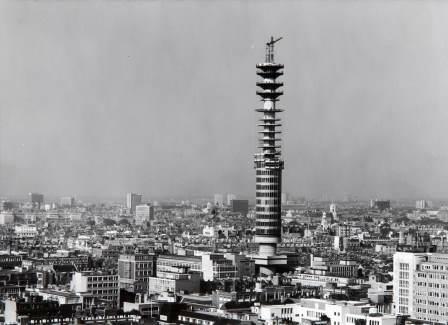 In a memo, dated 7 December 1967, civil servant M. Sharpe reported that the ‘details of the first year’s trading at PO Tower have now been collated….well over 1 m. people visited the tower during the period and a very satisfactory return on capital of 37% was made. Other sources of revenue, i.e. shops, restaurant, binoculars etc, were also extremely profitable’. As Dominic Sandbrook puts it ‘The success of the Post Office Tower as an iconic tourist attraction owed a great deal to the contemporary enthusiasm for science and technology’ . Harold Wilson caught this mood most adroitly with his famous speech to the Labour Party conference of 1 October 1963 when he spoke about ‘the Britain that is going to be forged in the white heat of this revolution’ and the need ‘to think and speak in the language of our scientific age’. There was a great deal of emphasis on futurism – television was rapidly developing, the range of automated products was expanding. The Telstar communication satellites had been launched, Yuri Gagarin had made the first manned space flight, the Space Age was upon us. As Dominic Sandbrook explains, ‘scientific’ designs were very much in during the ‘60s: ‘pots, mugs, jewellery, lampshades, even public buildings like the Post Office Tower in London and the Rotunda in Birmingham: all were heavily based on the clean, confident geometric shapes that typified the ‘look’ of the mid-sixties’ . The public were shocked when, on October 31 1971 , a bomb exploded in the Post Office tower, which caused extensive damage but no injuries. The restaurant was closed to the public for security reasons in 1980, and public access to the building ceased in 1981. 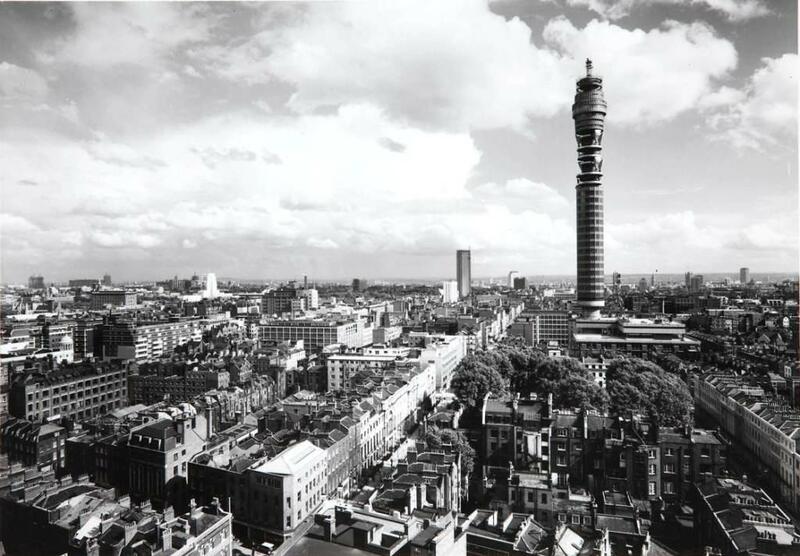 It is now known as BT Tower – it sometimes used for BT corporate events, but there’s no public access. The building, which is now Grade II listed, is still in use, and is the site of a major UK communications hub. In the age of the Shard, it's easy to be blase about the Post Office Tower, which has been overtaken by numerous skyscrapers. However, it still has a place in the affections of many Londoners and Britons in general. And we shouldn't forget how, in the mid to late Sixties, this thin cylinder of glass, steel and concrete symbolised a new mood in Britain - a new spirit of modernisation, a great feeling of enthusiasm and optimism attached to new technology – and it's that dynamism and optimism, and confident sense of style that I find very appealing.